Also serving communities of Footville. There are 4 Assisted Living Facilities in the Brodhead area, with 3 in Brodhead and 1 nearby. The average cost of assisted living in Brodhead is $2,300 per month. This is lower than the national median of $3,345. To help you with your search, browse the 4 reviews below for assisted living facilities in Brodhead. On average, consumers rate assisted living in Brodhead 5.0 out of 5 stars. Caring.com has helped thousands of families find high-quality senior care. To speak with one of our Family Advisors about assisted living options and costs in Brodhead, call (855) 863-8283. Home to notable individuals such as poet Thax Douglas, Brodhead, Wisconsin, is a small city located in both Green and Rock counties. Of the 3,291 residents, roughly one out of every three is age 55 or older. These individuals have their choice from among seven assisted living facilities, four of which are nearby in areas such as Monroe and Evansville. The communities all provide services such as leisure activities, nursing and personal care and transportation. They report to the Wisconsin Department of Health Services, Bureau of Assisted Living, Division of Quality Assurance. Overall, it’s 13.4 percent cheaper to live in Brodhead, Wisconsin, than the national average. The city won’t help tighter senior budgets in common areas of concern, such as transportation or health, but housing is 38 percent cheaper. Unlike other areas that have lower property values due to increased crime, Brodhead gives seniors a lower home cost with crime rates that actually are slightly lower than average. Property crime and violent crime stand at 32.7 and 30.9 out of 100 (100 is worst), compared to the national averages of 38.1 and 31.1. Seniors thus won’t have to sacrifice safety to save money or find an ALF with reasonable room and board costs. Seniors might not appreciate Brodhead’s tougher, Midwestern climate, as there’s more snow than average, fewer sunny days than average and temperatures get as low as 11 degrees in the winter. The overall Sperling’s Comfort Index is much lower than average (40 versus 54 out of 100). According to the National Air Toxics Assessment, air quality in Brodhead is quite good, scoring 81 out of 100 (100 is best) compared to the national average of 58. Seniors might find that this alleviates symptoms of respiratory conditions, which are common among the elderly. Brodhead offers an array of activities suitable for seniors, such as the Wildflower Art Festival, Covered Bridge Days, Crazy Horse Campgrounds, Twilight in the Park Concerts, the Decatur Lake Country Club and the Sugar River Raceway. Seniors also can take advantage of the city’s multiple parks, adult sports programs, public library and Historical Society. Brodhead has few facilities from which to choose in the event of medical emergency or illness, with the nearest major hospital in Monroe. Assisted Living costs in Brodhead start around $2,300 per month on average, while the nationwide average cost of assisted living is $4,000 per month, according to the latest figures from Genworth’s Cost of Care Survey. It’s important to note that assisted living rates in Brodhead and the surrounding suburbs can vary widely based on factors such as location, the level of care needed, apartment size and the types of amenities offered at each community. Financial help for seniors who require ALF care in Brodhead, Wisconsin, is limited. 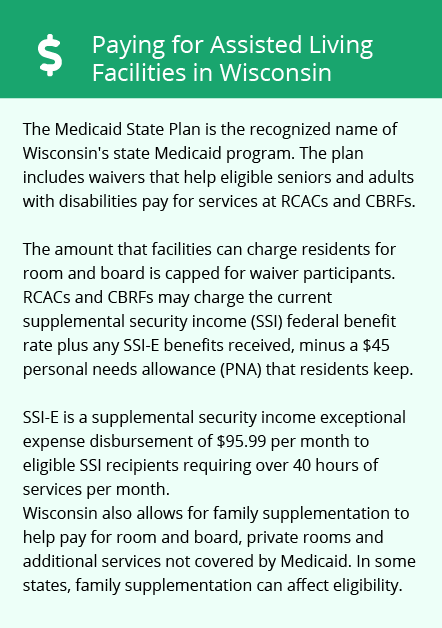 The state provides residents with minimal funding through the SSI Exceptional Expense Supplement (SSI-E). Brodhead and the surrounding area are home to numerous government agencies and non-profit organizations offering help for seniors searching for or currently residing in an assisted living community. These organizations can also provide assistance in a number of other eldercare services such as geriatric care management, elder law advice, estate planning, finding home care and health and wellness programs. To see a list of free assisted living resources in Brodhead, please visit our Assisted Living in Wisconsin page. 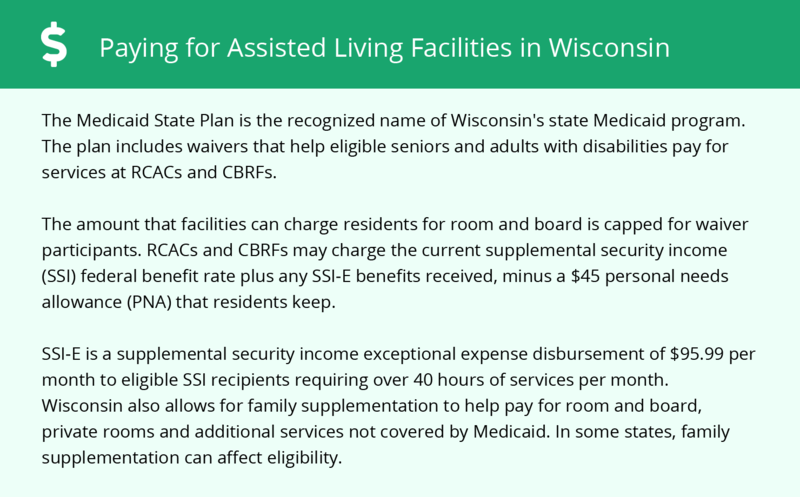 Brodhead-area assisted living communities must adhere to the comprehensive set of state laws and regulations that all assisted living communities in Wisconsin are required to follow. Visit our Assisted Living in Wisconsin page for more information about these laws.